Br. 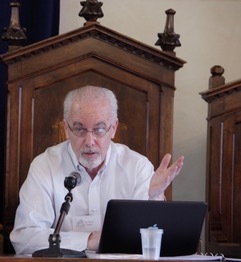 Kevin Cawley of Edmund Rice International joined a large group of scholars and practitioners this summer at a Conference on Spirituality and Sustainability assembled in Rome and Assisi from June 24 – July 4. Kevin had responded to a special invitation from the sponsors of the conference on “Spirituality and Sustainability,” as Executive Director of the Thomas Berry Forum at Iona. He was joined by Sister Kathleen Deignan, CND, Ph D, Berry Forum Co-Convener. They offered presentations on the deepening legacy of Thomas Berry, who was the principal deep ecologist around whom the Assisi Conferences gathered during eight years of his life. To mark the second anniversary of the papal encyclical, “Laudato Si’: On the Care of Our Common Home,” the sixty conferees attended an audience with Pope Francis, who acknowledged and thanked them for their work to protect our endangered Earth. On the first day of the conference in Assisi, the Berry Forum anchored the opening panel in the enduring vision of Saints Francis and Clare, followed by other presentations on Berry’s summons to “The Great Work” of our time. The remaining twelve panels over the 5 – day conference expanded the spirituality and sustainability theme with presentations by 60 participants from Europe, Latin America, Australia, New Zealand, Africa, Asia and North America. The convergence of such visionary people from a range of ecological-spiritual perspectives, centres, and movements made for rich dialogue about transformative global change based on spirituality and sustainability. Lively engagement continued during common meals and throughout the various group excursions to important sites in the life of St. Francis and St. Clare. Deep connections were formed, and The Thomas Berry Forum for Ecological Dialogue at Iona College has now cemented partnerships with several important allies to network for transformative global change. The goals of the conference were to network centres and movements seeking transformative global change based on spirituality and sustainability; identify key recommendations for transformative global change based on spirituality and sustainability; support young ecological leaders seeking transformative global change based on spirituality and sustainability. The Conference focused on worldviews (our guiding stories) grounded in ecological spiritualities, on transformative paths for education, policies, movements, lifestyles, and communities, on current expressions of ecological spirituality and their indigenous roots, and on the great transition toward ecological civilizations with new paradigms of science, economics, and law. There was a particular concern regarding the Doctrine of Discovery. The issue has been gaining attention recently with many indigenous spiritual leaders calling for the Holy See to engage more completely in a deeper discussion of the damage still accruing from these 16th century proclamations of the Church regarding the rights of indigenous persons. Participants also explored strategies to deepen and implement the United Nations new development agenda – the Sustainable Development Goals (SDGs) – and ways to protect and nurture sacred places. Several sessions were dedicated to key recommendations for creating a viable and spiritually vital global future, with particular reliance on the Earth Charter which became the basis of common ground and language for the leaders. Finally, the Conference fostered deep dialogue on how we can work together on the way forward toward a just, sustainable, and peaceful future that will support human development for all in a flourishing Earth community. Energised by this remarkable meeting, The Berry Forum will continue to plan our own convergences on campus in the spirit of Laudato Si and the vision of Thomas Berry, now with additional global partners as an outcome of our participation in this significant conference of exceptional environmental thinkers and leaders.